The Cafu Material System is the central rendering subsytem of the Cafu engine and its graphical tools like CaWE, the model viewer, the terrain viewer, and so on. It takes polygonal meshes of geometry and renders them on the screen. While doing so, it is responsible for the materials that the mesh surfaces show. Said differently, it defines how the rendered polygons look. The Material System is not involved with or responsible for what gets rendered, when it is rendered, how the meshes are spatially formed or organized, etc. Unique rendering across all programs: The Cafu engine, CaWE, the model viewer, the terrain viewer, the material viewer, … all use the same rendering code and technology. I was finding myself writing, debugging and synchronizing the same code over and over again, for each mentioned program and for each supported 3D API, multiplying the expenses until chaos. This was one of the main reasons to start the MatSys. The savings are enormous, and I can be sure that models in the model viewer are rendered 100% identical as in CaWE or the engine. Unique rendering across all types of geometry: Worse than the above, I found myself implementing the same technology even several times in the same program: once for the models, once for the world polygons, once for the terrains, etc. Sharing global resources like textures or GPU programs was impossible, and the Cafu engine happended to render the world polygons with different technology than the models, the terrrains with a third, and so on. Debugging was a nightmare. That's all over now, everything is now handled by the MatSys, and the savings and the leap in improved code-design were huge. Can easily add support for new platforms, operating system, APIs. Without any danger to break existing code, and even without having to touch existing code at all, new renderers and new shaders can be introduced: If hot-plugging a new graphics board into your computer was possible, the Cafu engine could handle that situation while running. You can even supply and use a completely new renderer without stopping or recompiling the executables. Just have the engine reload the renderer, and the new technology will be immediately used. Users and artists get a much greater and more flexible control over the rendering, as all materials can be edited independently from the worlds or models that they are applied to. The MatSys is shipped in several separate modules. Each module offers the same features, but they are different in that the implementation of each is based on a different underlying technology. These modules are called the Renderers of the Cafu MatSys. For example, a MatSys renderer exists that is based on OpenGL 1.2, another is based on the latest programmable GPU features and others are somewhere in the middle. In fact, Cafu ships with several of them, and it uses the MatSys by actually employing one of the renderers. Technically, renderers are dynamically loaded libraries (.dll files on Windows systems), and you can find them in the Renderers/ subdirectory of the demo or SDK. When the Cafu engine or another program starts, it first scans the list of all available renderers, automatically determines the one that is the best (or most appropriate) for your system, and then loads it (this specific instance of the Material System) for use. This way it does not matter wether your computer is very old or the latest leading-edge system, wether it uses OpenGL, Direct3D or software-only rendering or wether its OS is Windows or Linux: You always get the best possible graphical output – this is one of the goals the MatSys has been designed for! Materials define what surfaces look like and what features a surface has, and if you are interested in Cafu editing, you'll most likely get in touch with them. For example, mappers assign materials to world geometry in order to give all objects the look and feel that they want. Modellers often create new materials for the creatures that they create, and then assign them to the polygonal meshes of their model. When it comes to rendering, the Cafu engine takes both the meshes and their assigned materials, and hands them to the Material System. The MatSys then does it's best to render the mesh with that material as accurately as possible on the available technology. Each material is referred to by its name, and is defined in a material definition script file. These files have the suffix .cmat and can contain the definition of one or more materials. They are simple ASCII text files, and you can find many examples in the Games/DeathMatch/Materials/ subdirectory of the demo or SDK. Using materials is very easy. For example, when you're mapping with CaWE, you apply materials to world brushes in the same way as well-known textures used to be applied in other or older map editors, too. Please see the CaWE User Guide in this Wiki for more information. Creating materials often requires two steps: You first have to create or acquire the texture maps that are used or required by the material. These are typically png, jpg or tga images that define the diffuse-, normal-, specular-, and other component maps that will be referred to by the material. Then you have to write a material definition into a .cmat script file like in the example above. 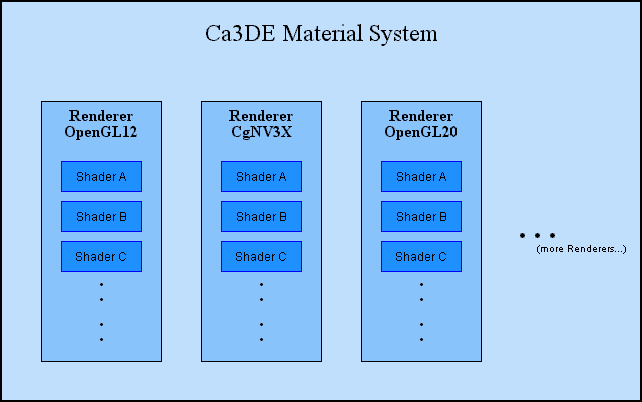 Very advanced materials may also involve a third step, namely in the case that they require their own unique shader (see below). The documentation in this Wiki has detailed documentation about each of these steps. The meaning of the word Shaders in the context of the MatSys is a bit different than its meaning in other contexts (the word “shader” has many meanings, after all). Shaders are objects of C++ code, and each renderer has several of them built-in (in some cases up to a few dozens). Most people will therefore never be faced with one of them. However, shaders are the final instance in rendering, they define exactly how the looks of a certain material is achieved. Therefore, when the MatSys is given a certain material, it consults its library of built-in shaders and selects the very shader that is best suitable for rendering that material. The selection is automatic in most cases, but can also be manually overridden by the material. Even the case that there is a non-optimal assignment may sometimes occur, e.g. when on the underlying hardware no shader can be implemented that renders the desired material perfectly. In this case, a sub-optimal (but still the best) shader is selected. This mechanism provides a fall-back solution for arbitrarily old hardware, meeting another important design goal of the MatSys. Shaders therefore provide the key to be able to always support new hardware: If new 3D hardware features become available, we can quickly write a new shader for it, put it into the appropriate renderer, and then materials can use it, either from auto-selection or by explicit statement. This ability is a great feature that makes it easy to scale the MatSys for future hardware, limited (e.g. embedded) hardware, old hardware, etc. Future SDKs will come with the ability to plug-in custom shaders, and the Wiki documentation about shaders will updated until then. The real shaders actually have different names than in this sketch, but shaders with the same name (e.g. Shader B) all (try to) render a given material in the same way – as much as that is possible on the underlying rendering technology. The shaders of each renderer may ship as built-in shaders or can be provided as custom plug-in shaders by MOD authors.